Since April Fools’ Day is only a few days from now, we thought that we would show you a list full of plenty of good ideas! The best way for one to be convinced that an idea is actually good is to see how it works, and this is what the list below is about! 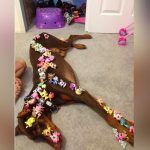 It shows how some people put in the extra effort into making their pranks were truly epic, and they would definitely inspire many of you! We hope you are able to pull off whatever you have in mind for this year’s April Fools’ Day! Having fun is what matters the most! In order to pull off a good prank, you need two things – a good idea and the guts to do it! 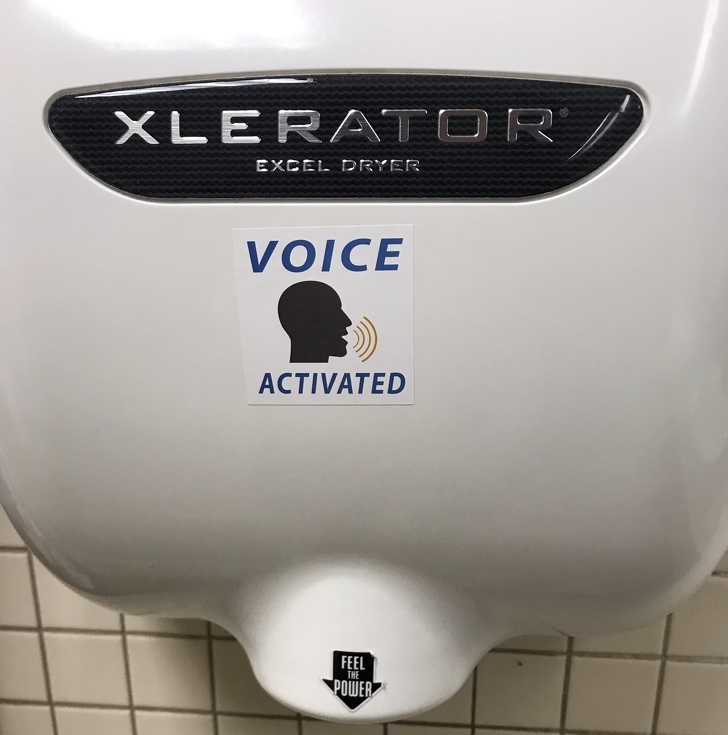 In this case, it took a bit more effort because this person had to produce stickers that looked genuine enough for people to be convinced they were authentic. We need to admit that if we didn’t happen to have the same idea some time ago, we would fall for this one, too! Can you imagine coming home to find your room like this? We find it hard to believe that these people made this effort in order for them to prank someone unsuspecting. In this case, that someone was one of the two daughters in the family. 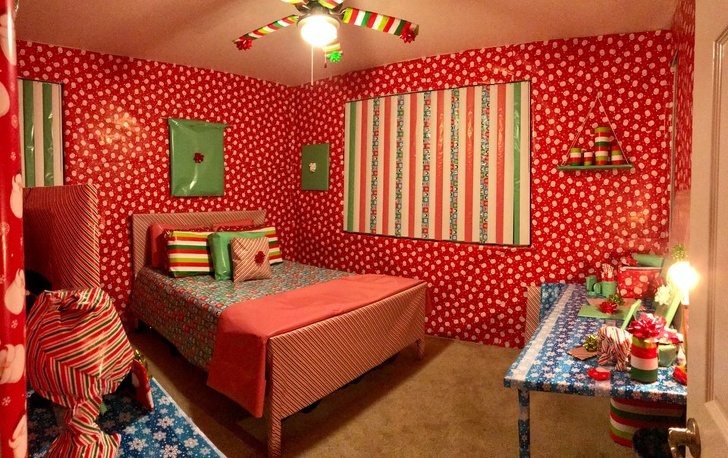 They picked her from the airport and arrived home in the middle of the night, and she found out that her room was completely wrapped like a giant Christmas present. If you have no problem using a public restroom, than you are lucky. Many people are hesitant when it comes to entering one, because they are grossed out or they are afraid of all the germs. However, even if you are not bothered by this, you should look out for something else, too. As the photo suggests, some clever prankster created a setup that is able to scare absolutely everyone! We believe that this is one simple but really savage prank! 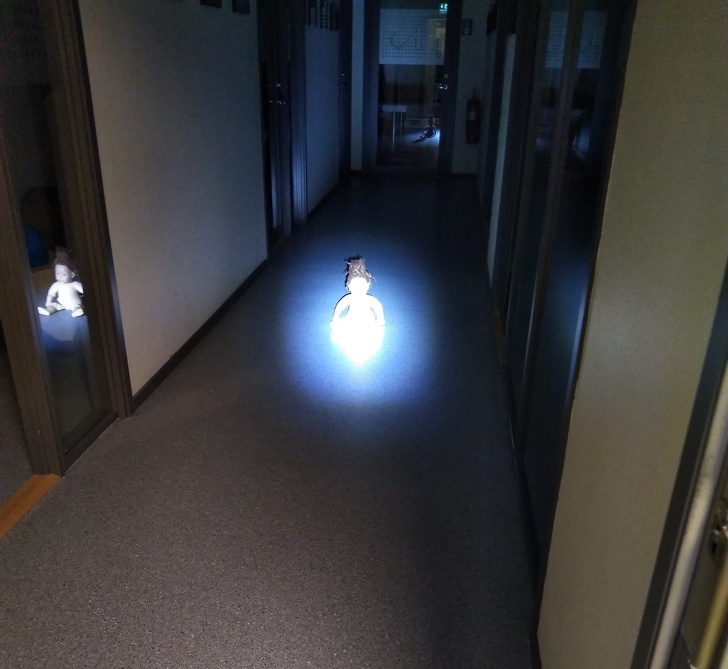 Someone left this doll in the middle of a hallway in their office building. The person knew that someone would eventually come across the creepy doll, and considering it was dark, the scary effect was guaranteed! We guess that some people could be scared to the point where they would not enter the office again! 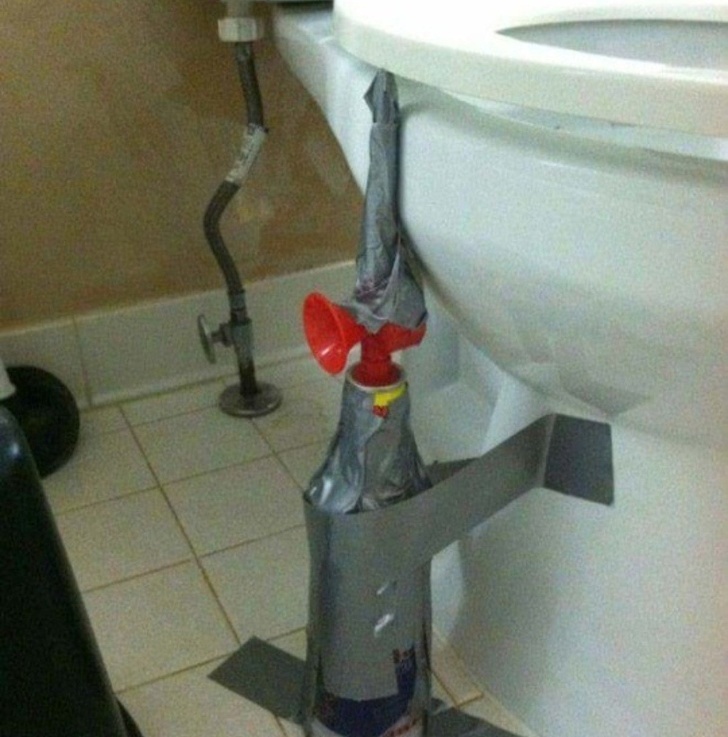 Here is another brilliant idea to prank someone regardless if it is April Fools’ Day or not. However, pulling this off means that you need to invest some time in it, and it requires planning as well. 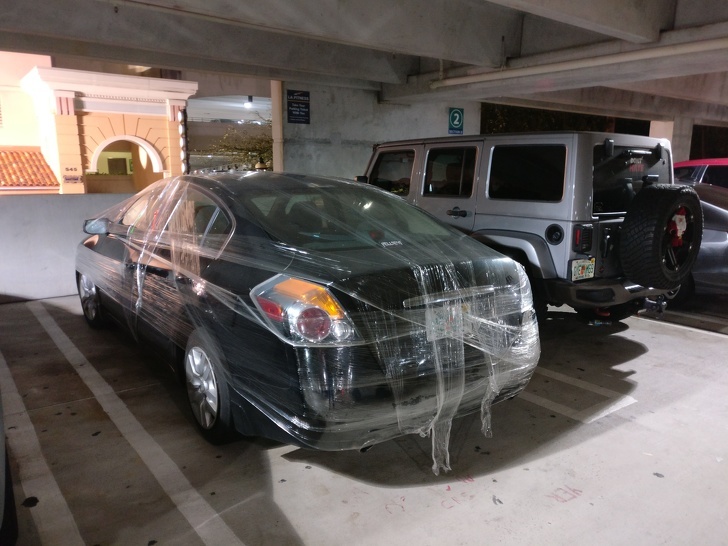 After all, you would not want to be caught while wrapping the car, right? It would work best if you know that the owner of the car is in a hurry to get somewhere fast. Now this is what we call one brilliant way to surprise someone! 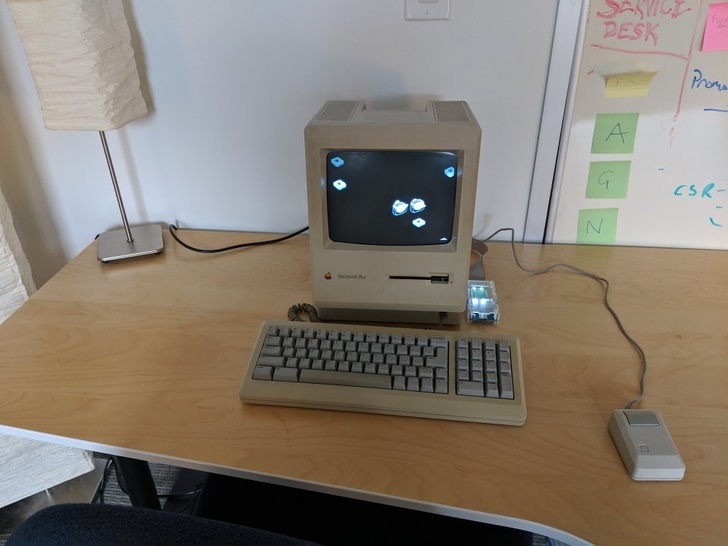 There was a new developer who was about to come on their first day at the new office, but can you imagine their surprise when they found this workstation! The other people working there came up with this clever way of showing their new colleague that they know how to have fun! If you want to pull off the best possible prank, you need to plan ahead and give your best, but sometimes even the tiniest effort is enough. 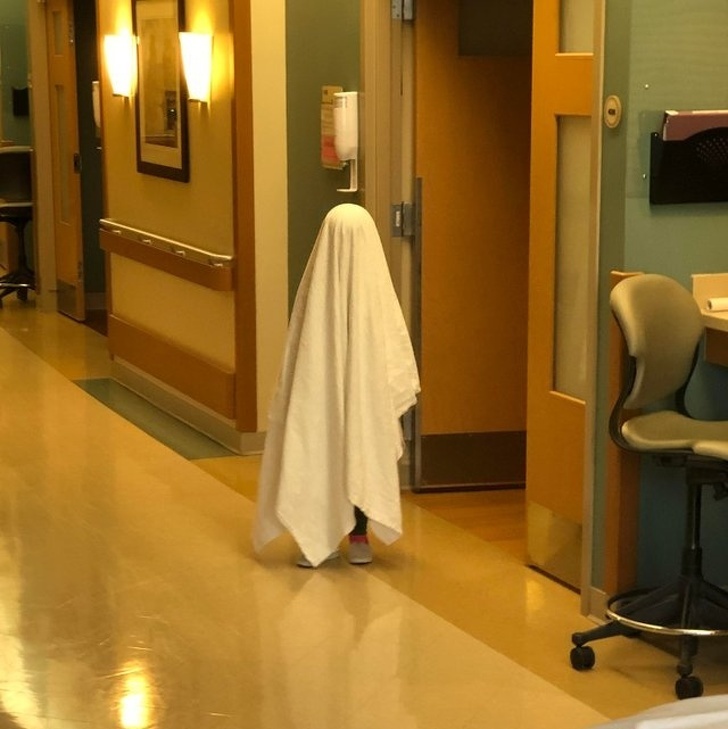 In this case, one little girl decided to scare people at one hospital despite the fact such a setup was more appropriate for Halloween. The good part is that people played along and some probably pretended to be surprised and scared! The image shows that kids should try to pull off whatever they have in mind! Well, sometimes pranks are made only to demonstrate one’s ability to come up with witty jokes and puns. In this case, nobody would be scared in any way, but we guess that everyone would appreciate the clever thinking of the person who came up with it! 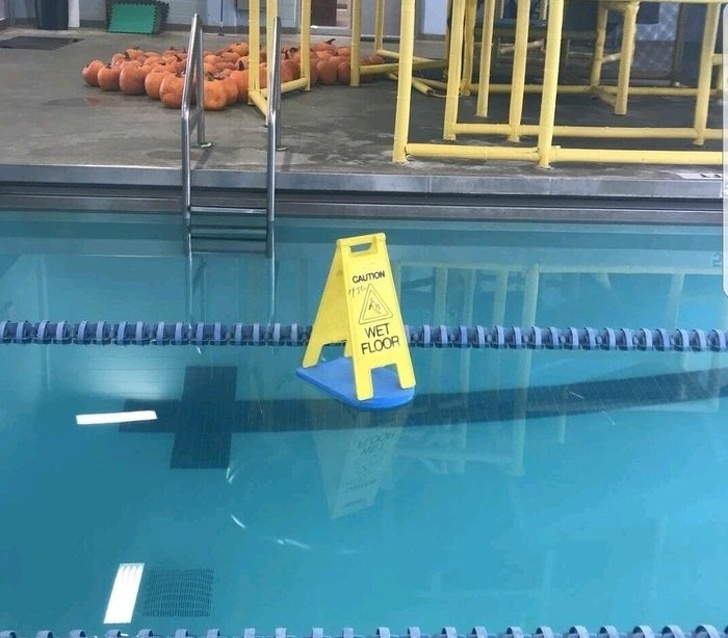 This sign is technically correct, but it only shows the obvious, and this is what makes it funny! The person who shared this image explained that there was a coworker who had the audacity to eat everyone else’s treats, which is definitely not the right thing to do! 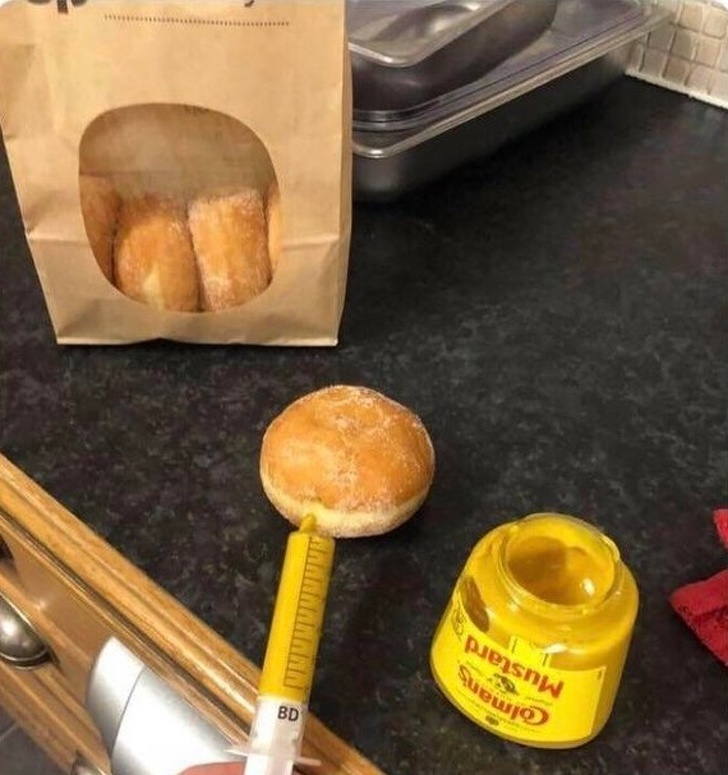 Teaching this person a lesson seems to be a pleasure, and we are sure that they watched him bite into this mayo-filled donut and enjoyed the following reaction! 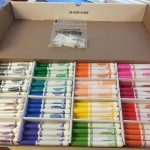 This is a perfect April Fools’ Day prank! This is a school hallway entirely covered with plastic cups! It does look like some alternative art installation, but it is nothing but a prank, and a good one, too! We appreciate the kind of pranks in which people put in a lot of thought and effort, and this is the case here! Maybe it was intended to impress the teachers or the principle because they are the ones who come early in the morning. The janitors were not happy about this for sure! 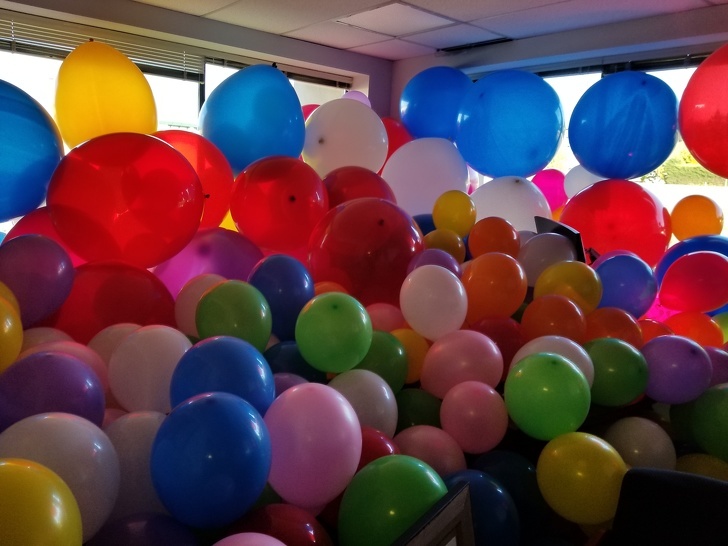 It seems that many people working in office buildings might appear as professionals, but they also have a different side to them – they can pull off a prank! When this company’s boss was out of the office for a short period of time, some of the employees did this! We can imagine the face of their boss when they returned to see this! Let’s hope that they had a sense of humor! Please note that this is one prank that is not applicable everywhere! In fact, you need to be sure that if you want to set it up for someone, they would be able to take it the right way, because it may have consequences! While we completely agree that it is an extreme way to prank a person, it is also a clever one! The person who came up with it was probably inspired by cartoons! 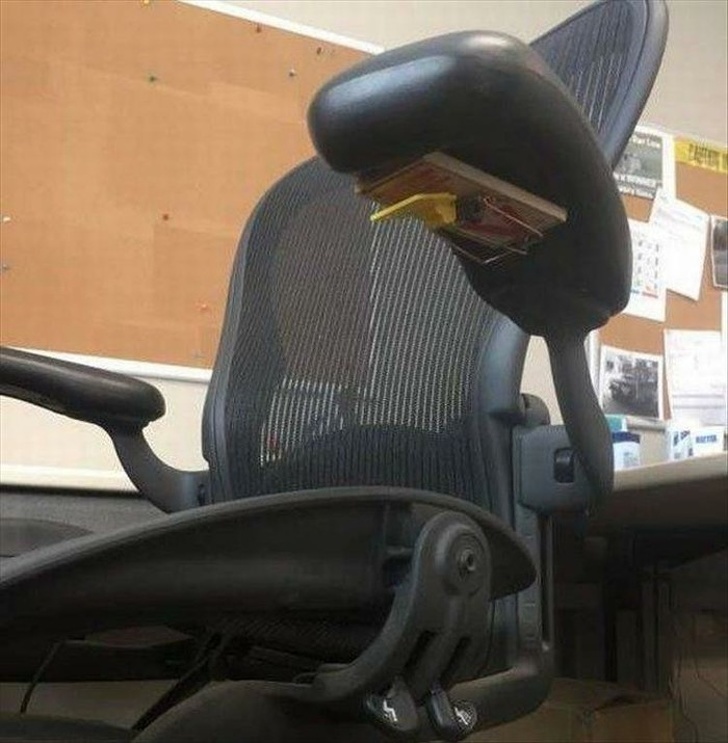 We love pranks like this one! This is so simple and brilliant at the same time that we love it! 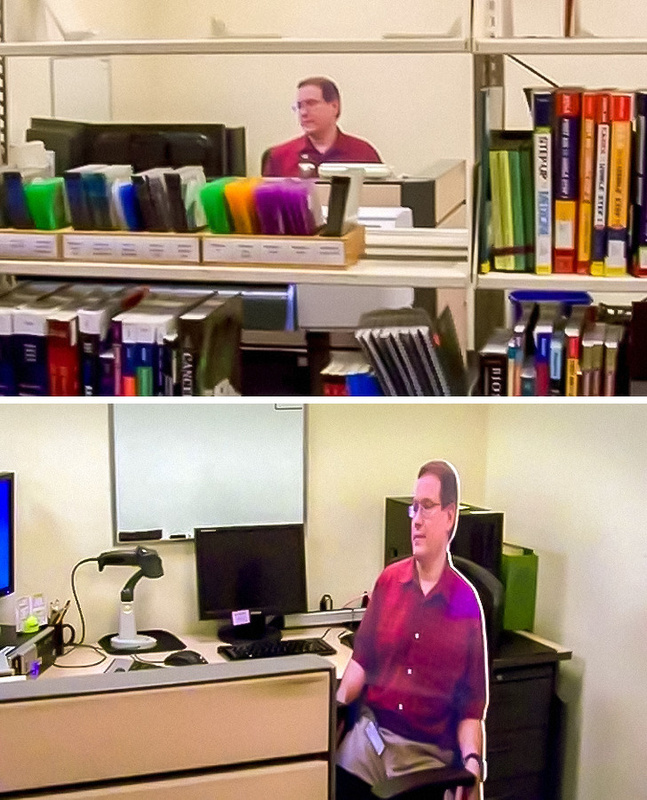 This person was about to be out of the office for a whole week but he made sure that he would be able to surprise them the right way using this cardboard cutout! We believe that most of his colleagues were surprised to see him and even greeted him in the morning, too! We were really impressed with this because it is actually a simple way to prank a large number of people! 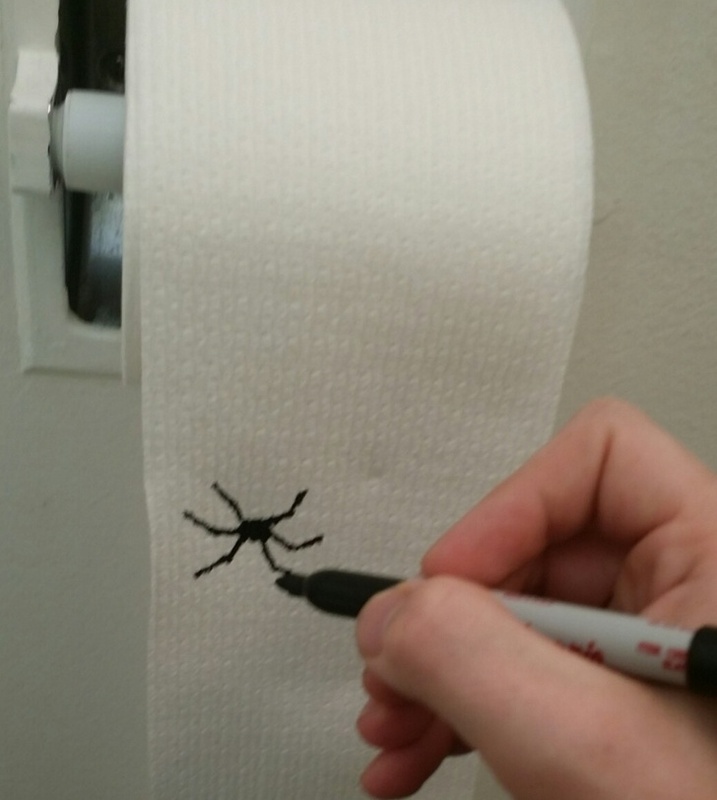 The prankster drew spiders over the entire roll of toilet paper and then rolled it back and put it in the restroom. It cost them several hours but we are sure that it was definitely worth all the effort. 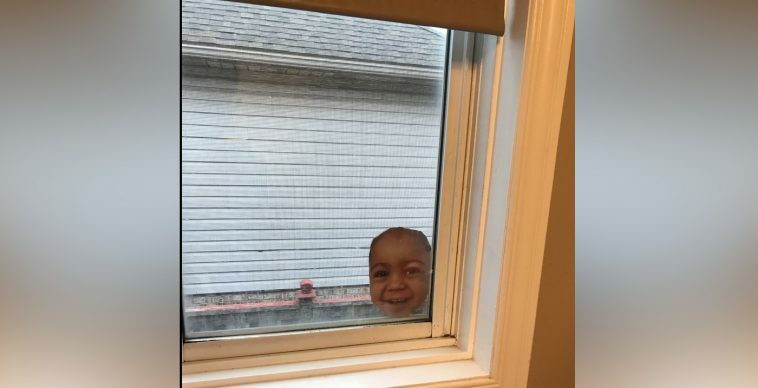 Probably tens of people were freaked out by this clever prank! If you are working at an office, this is probably one of the best things you could come up with! It shows how clever and yet simple pranks can be. 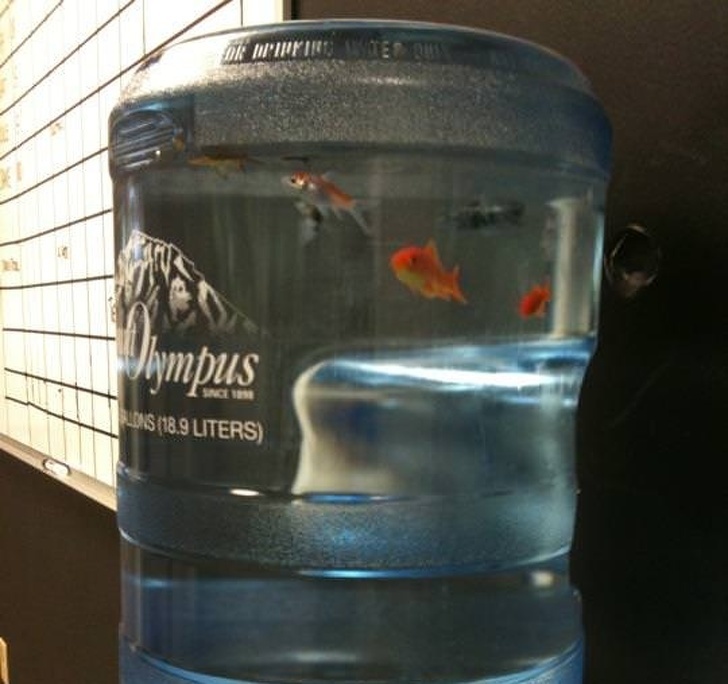 Someone went to the water dispenser with the intention of having a glass of water, but they were surprised to see goldfish inside! This is the kind of witty pranks we love to see because everyone would be pranked and some people would even drink water before realizing the dispenser was turned into a fish tank! Seeing this made us cringe and giggle at the same time, because it is amazing to see it but it was probably a burden to clean. What you see is the part of the office where the IT department was located. 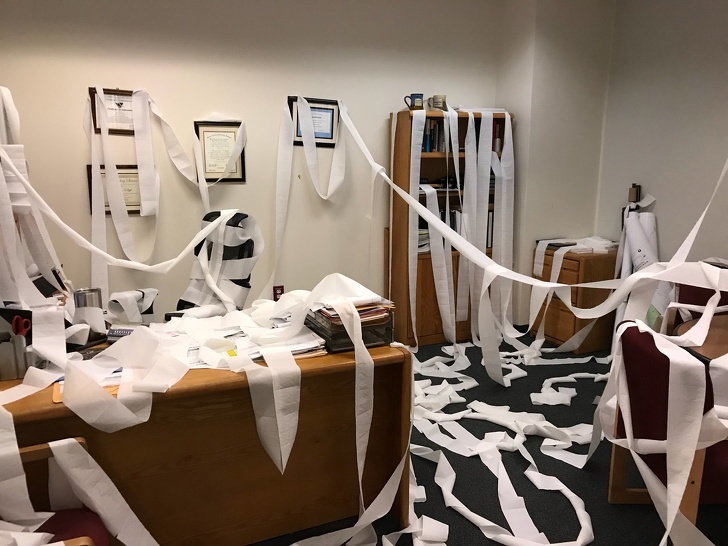 When the boss went away for some time, the other employees decided to engage their plan and they found a good moment to pull it off! This is a great April Fools’ Day idea. Well, it is not actually a prank, but rather a savage joke! This makes it a perfect way to troll someone and you could use it for any occasion! This person found a simple way to show what Chinese people see each time they meet someone who had a Chinese tattoo. 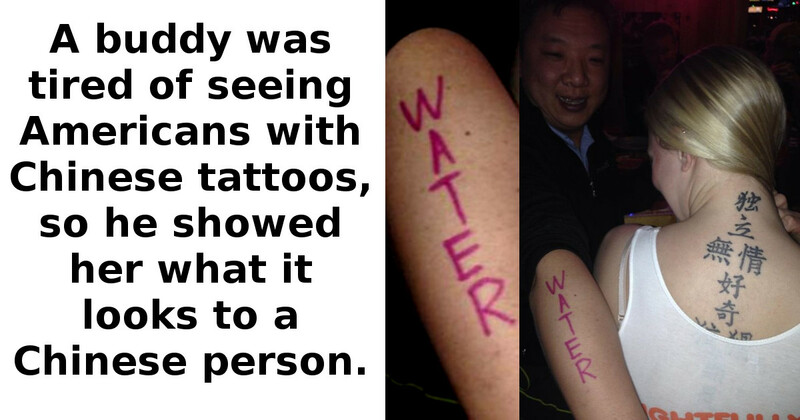 We guess that those tattoos are just words to them, and looking at it from their perspective is actually funny!